Halloween is huge in the UK now with people spending an estimated £300million on the event. 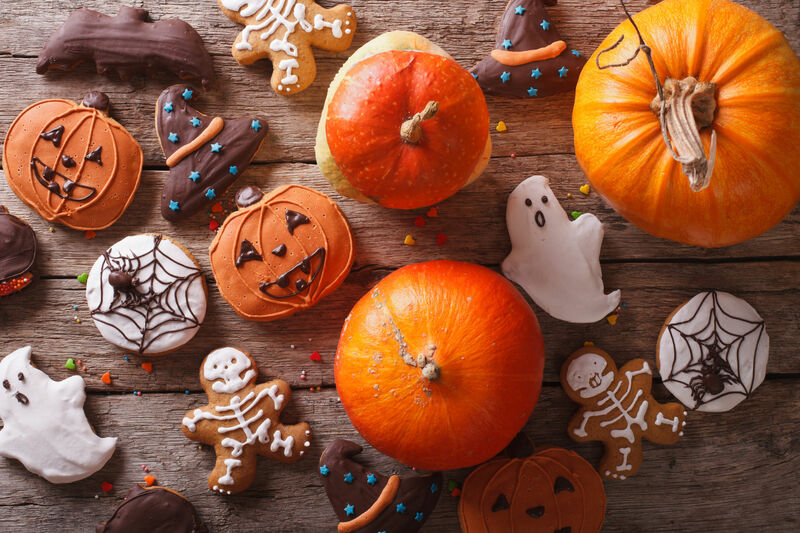 Our American cousins go all out on it and their enthusiasm for all things spooky has drifted across the Atlantic and now shops are crammed with everything from creepy costumes to freaky food. There’s nothing you can’t buy to celebrate Halloween. Halloween season lets your creative beast come alive as your dream up food to serve to any passing little monsters. There are plenty of pre-packed, pre-prepared offerings, but if you’re having your own party then making your own food is a lot of fun and your guests really will appreciate your efforts. Finger food can look like fingers, jelly becomes snot and cherry tomatoes with a bit of cream cheese and an olive on top can be very squeezable eye balls! We found some great, fun recipes here which your young ghouls can help with. Another beauty of Halloween is that adults can enjoy it too and can have just as much fun as the kids – there are some great cocktails to conjure up at Halloween. And if you and your grown up friends are completely child-free then these frightful food ideas will go down a treat at your own dead of night party. Whatever you do, have a very happy Halloween!